STOP using dangerous Glass Jars in your shop that can shatter and seriously injure if dropped or struck! 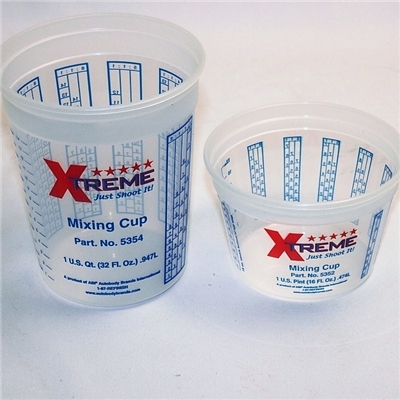 These convenient, graduated mixing cups allow quick measurement of finishing materials for spraying. Although they are not "unbreakable", they are safer to use in the shop than glass. Resistant to most shop chemicals, these plastic cups are re-usable and are great for short-term storage of stains, clear coats, fillers, dyes, toners or shellac solutions. A very handy container for brushing and wipe application of most products. Available in 1 Pint (16 oz / 473ml) or in 1 Quart (32oz / 946ml) sizes. Lids are not included with the cups. Order lids separately. Economically packaged in 10 packs or purchase full cases at discounted pricing. Available in Pint (16 oz / 473ml) or Quart (32oz / 946ml) sizes. Conveniently supplied in 10 packs. Also available in case quantities. For multiple cases, please contact us for pricing.